A clever little towel that will do more than most! High in quality and rich in thickness to retain heat better than standard towels. Our micro loop technology helps to remove product from the skin. 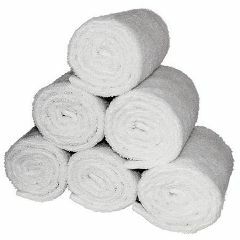 The unique towel size, 8"W x 23"L, wraps the face making it ideal for facials, barbers wet shaves, manicure, pedicure, massage, waxing and many more types of body treatments.